Through completing this course, nurses and other health-care providers will gain confidence and know-how in selecting and using best practice guidelines to support and sustain best practices in their workplace. 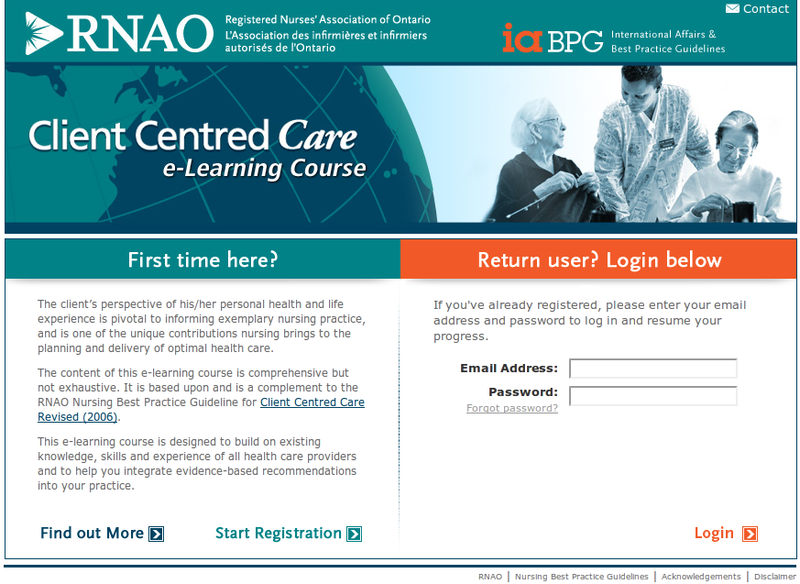 By completing this course, you will meet the requirements to become an RNAO Best Practice Champion. This is a free course. When it comes to supporting clients with addictions, nurses in all practice settings can play a significant role and make a significant difference in their care. 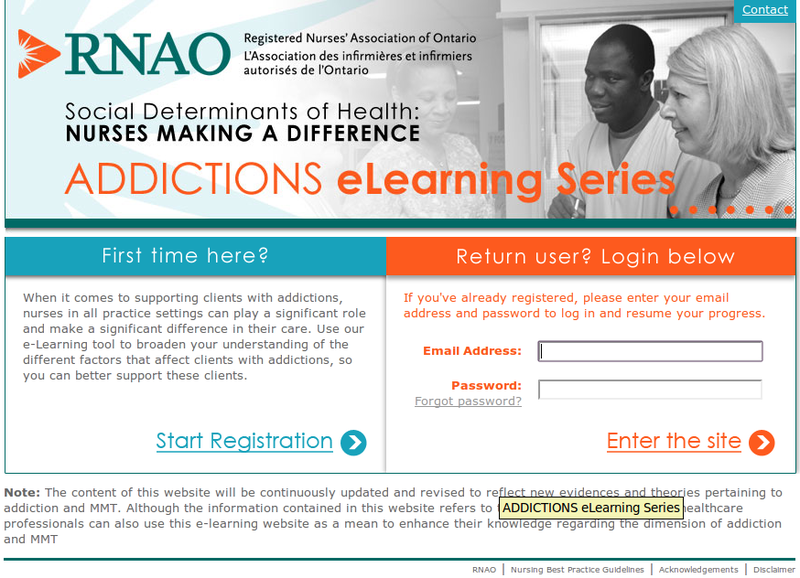 Use our e-Learning tool to broaden your understanding of the different factors that affect clients with addictions, so you can better support these clients. 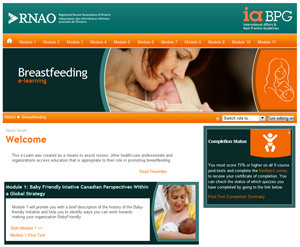 This e-learn has been created as a means to assist nurses, other health-care professionals and organizations to access education that is appropriate to their role in promoting breastfeeding. As such, it aims to develop the knowledge, skills and attitude required to implement internationally recognized best practices in breastfeeding to create a baby-friendly environment. This is a free course. 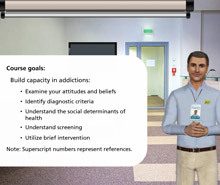 The client’s perspective of his/her personal health and life experience is pivotal to informing exemplary nursing practice, and is one of the unique contributions nursing brings to the planning and delivery of optimal health care. This free course is intended to support nurses and health care professionals to support clients experiencing a substance use disorder. It will broaden your understanding of the factors that affect clients experiencing substance use disorders. This course will discuss foundational concepts and evidence based practices when working with Indigenous people who use substances, layout terminology, historical context related to Indigenous people and factors that impact rates of mental illness and substance use among this population, and introduce strengths based approaches, protective and cultural healing modalities when working alongside Indigenous peoples who use substances. 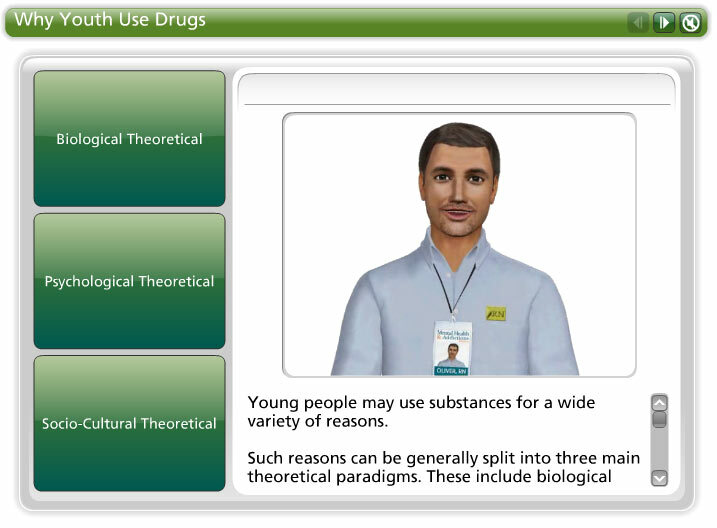 This course uses frameworks evidence to discuss youth and trends regarding substance abuse. Nurses and other health care professionals have many opportunities to help people address their smoking habits. 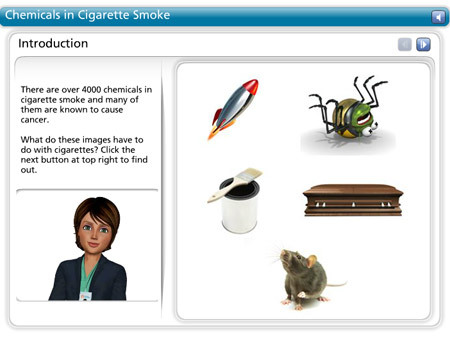 Learn enough to get you started right away on conducting brief interventions on smoking. 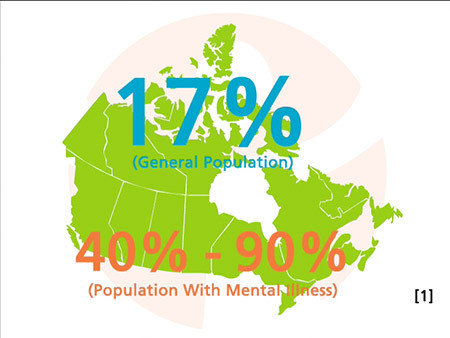 This course addresses the special considerations that need to be taken into account when providing smoking cessation assistance to clients with mental illness or concurrent addictions. This work is funded by the Ontario Ministry of Health and Long-Term Care. All work produced by RNAO is editorially independent from its funding source.